uh…Don’t know. Don’t really care. In less than two weeks, the library@orchard will ceased operations, the books will be re-distributed to other libraries and the space that the library currently occupies will be rented out to other tenants. Taking a quick look at the other tenants beside and around the library, the space will probably be used for more beauty spas, salons or some fashion boutiques. My trip to the library yesterday to fulfill my “job” as the citizen reporter turned out to be educational and at the same time, leaving me with some frustration and sadness. Jillian Lim, the librarian is extremely helpful and I love talking to people who love books. I was told that despite the library’s aim to target the youth and promote a great reading culture amongst this target group (thus the reason why this library was set up in the midst of Orchard Road), the youths did not seem to pop by as expected. Instead, I see more adults (quite a lot of aunties), some foreigners and even tourists walking around. My question to Jillian was, why on earth is the library tucked remotely on the top floor of Ngee Ann City – a mall that is currently known to house luxury brands such as the Gucci, Chanel and Tiffany? I was then told that several years ago, around the time that the library was set up, that particular location was a big hit with young people and had tenants that sell products targeting the youths. I didn’t get a chance to talk to the mall’s landlord but based on Brennan’s post about the closing of the library, I gathered that the landlord thinks the big space that the library is occupying now is more profitable and makes more sense to SELL to the youths rather than encouraging a reading lifestyle. Kind of sad, isn’t it? Anyhow, Jon and I walked around the library with our notebooks, camera and recorders to try to capture any interesting things we can pick up. Jon, being a foreigner thinks Singapore really has world-class standard libraries and the library@orchard is definitely very cool and we should all count our blessings. But do Singaporeans really remember to count them? I am afraid, (based on the chats I had with some people), the answer is No. (However, all hope’s not lost. I managed to speak with others who have constructive and some great things to say about our lovely boutique, lifestyle-concept library@orchard. While I download the images and prepare for the next post, people who are reading this, do pay your final visits to the library@orchard, drop the library or this post some of your thoughts. Those who have images/ videos to share, visit http://blogs.nlb.gov.sg/orchard/ for more information. The library is also holding a closing party on 30 November. Those who are free that evening, do come for the event. Registration details can be found at the library’s blog). My next blog post of the library will also highlight one of the performances by The Novelties held at the library on 17 November 2007, and a short chat with the performers. I also found a group of young girls gathering near the entrance of the library – not studying, not reading books but folding 1000 paper cranes. 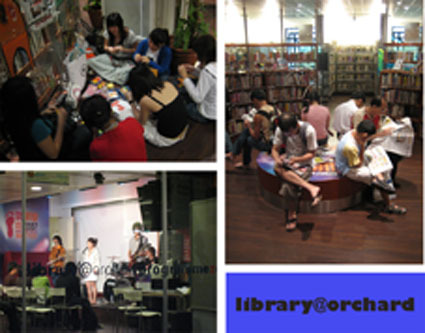 So, watch this space for part 3 of the closing of library@orchard!! This entry was posted in Bookish Stuff, Travel and Events and tagged Books, libraries in Singapore, library@orchard, ngee ann city, the novelties by Priscilla Tan. Bookmark the permalink. Pingback: Car Insurance Info » uh…Don’t know. Don’t really care. Pingback: Moving On: library@orchard in transit » Blog Archive » R U Hungry? Thanks for answering the call for citizen reporters! I really like your perspective from this post — your views, Jon’s and the people you interviewed. I don’t see the reactions by the youths you interviewed as “sad”. Or maybe I’ve been in this line for too long! lol. I wonder what handbags are of better quality – Gucci or Fendi? What’s your opinion?